LoginIt is very efficient and user-friendly app for helping you to login to your favorite web sites and applications. App was designed to make copying of login data as quick and easy as possible. The only thing you need to do is to choose what you want to copy. It really cannot be simpler. 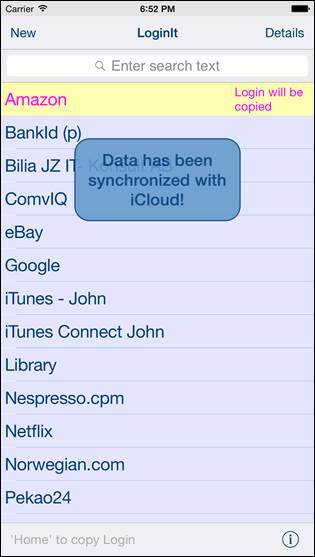 Starting from version 2.0 app supports iCloud data synchronization – login data on all iOS devices with same iCloud account will be synchronized automatically. LoginIt is particularly useful when you login to the web TV, online streaming, iTunes, etc. Just register Login/User ID and Password in your app. Later on you can easy copy them using very useful feature – auto copy of login and password. · Login password is copied just by selecting it in app: copying operation is performed automatically during switching from LoginIt to another application. · Information about copied item is communicated to the user by local notification. App is optimized for iOS8, iOS 7, iOS 6, iOS 5.